Every month or so, I’ll be publishing the English translations of Italian short stories that I’ve come across and liked. I read Pipi’ a Paris by Carmen Vella a few months ago, but today being the International Day for the elimination of Violence Against Women, it came back to me. Say No! 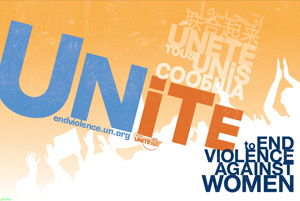 UNiTE to end Violence against Women. Instead of talking about physical violence, this short story made me think about the other forms of violence inflicted on women. And not always by men. Women are often just as guilty … for inflicting pain and humiliation on each other, and for failing to stick together. The fact that this can happen right under our noses, not in distant countries or behind closed doors, is even more shocking. The story’s called Pipi’ a Paris in Italian, and I’ve named it “A Pee in Paris” in English. Rich people, nowadays, really tick me off. They stand there with a Louis Vuitton bag on their shoulders or a Rolex glittering on their wrists, complaining that the crisis is really starting to bite this year. Thoroughbreds in Dior blinkers, that’s what they are. Me, I’m a wedding planner. An apprentice wedding planner, to be more precise. I plan weddings for people who’ve got enough money not to have to do it themselves. Like madam here: Luisella Berrini Della Porta. Beige coat with cropped sleeves and caked-on foundation in the same colour. “Marta, how about going to the Jardin des Tuileries next? They’re just so fabulous, I’ve always thought, and I’d like them to be the setting for my photo shoot,” she asks me, tucking her blond highlights neatly behind her ears. We’re at Ville Lumière, where she’ll be joining her long-term fiance’ Gianfranco Magri in holy matrimony, after almost 10 years together. The hustle and bustle of shopping on the Champs-Élysées must be making her feel hot, as her upper lip is beaded with sweat.